Bridge is a symbol of art, landmark of the city, icon of development of a country. But what is Lungtenzampa Bridge? In the heart of Bhutan's capital city, where it should have been a beautiful bridge that could live up to the legend of bridge of destiny lies a dumb looking engineering blunder. It is not pleasing to look at, shapelessly huge and rough, giving an outline of a sleeping elephant seal. It is not friendly for pedestrians to cross and worse is when the summer rain dams up in its enormous depression right in the center of the bridge. If Phajo Drogom Zhipo and Khandro Sonam Palden had this bridge between them then, they would have gone back rather. Bhutan had built beautiful bridges way before London had the Tower Bridge (1894) or San Francisco had their Golden Gate (1937). We had built them without a piece of iron or a spade of cement. Without even a drawing. We have history. But history only. Today France has Millau Bridge, South Korea has Banpo Bridge, Singapore has Henderson Waves, China has Hangzhou Bay Bridge, Brazil has Oliveira Bridge, Germany has Magdeburg Water Bridge… all masterpieces of their country's architects and all landmarks of their countries. But what do we have? Lungtenzampa Bridge? If Zhabdrung came back he would die of shame. I dream to see a Bhutanese masterpiece stretch over the Wang chu one day, that is so beautiful that we are proud to step out of our car and walk over it in the evening, that is so unique that when world see it on TV or internet they know that it is in Bhutan, that is so intelligently built that there is way out for the rain water and way across for people, that is so iconic that it change the face of Thimphu. Pictures are linked to their original sources. Click on the pictures to get there. I bless you and your dream. Such a bridge is under-construction on the new Phuentsholing-Samtse Highway. Interesting read. 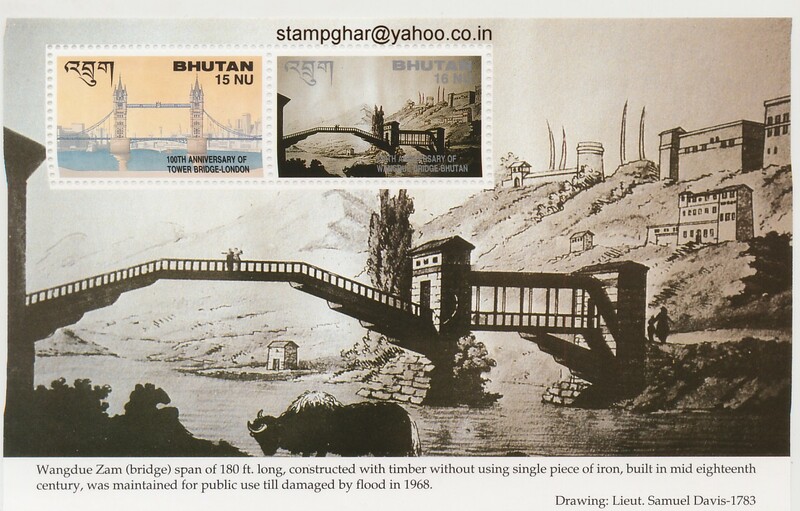 Haha nice one.......hope soon someone really decides to do something like you dream of...totally agree with you....neither does the bridge qualify as Bhutanese architecture ( than just for some paintings over it to fake it) nor does it really seems like an engineering produce. @ Auro: know that if I am blessed you are too.Thanks for the blessing. I have seen the model of the AmoChhu Bridge, it looks great. But the builders are full of complains and way behind schedule... I hope they don't compromise the beauty and quality of the bridge. there is really a need to gap the bridge between our age old traditional monuments and modern scientific discoveries. Young architects like sogyal would be possessing an ability to bridge these gap with the true blend of our unique culture and modern artefact. @Pinkpunk: Thanks. If you happen to be an architect please keep note of this. @Lethro: yes, bridge bridges gaps but Lungtenzampa fell in the gap perhaps...it's nothing traditional and nothing modern. It's in the gap between the two called blunder. Thanks for sharing my dream.